The Busan Gupo Livestock Market (also known as Gupo Dog Meat Market) is being pestered by the dispute over its violation of the School Health Act. On April 28, the Busan Bukbu Office of Education sent official correspondence to the Busan Bukgu District Office and the Bukbu Police Station demanding that the Gupo Livestock Market be relocated for being in violation of the School Health Act. The Gupo Livestock Market is in violation of the School Health Act because of its distance from the Dugchun Elementary School. (http://dugchun.es.kr/) The School Health Act specifies the area within the straight-line distance of 200m from the walls of elementary, middle, and high school educational facilities as a Relative Cleanup Zone. Within this zone, permits or licenses are limited by any business that may cause problem with sanitation and children’s education. 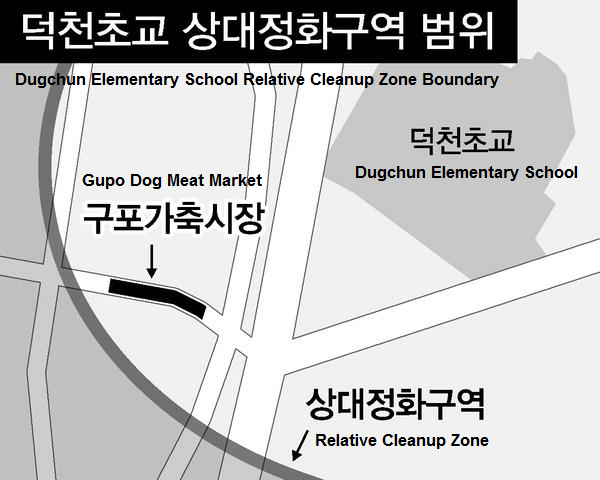 The distance from the entryway of the Gupo Livestock Market to the main entrance of Dugchun Elementary School is less than 200m, which means it is within the Relative Cleanup Zone and therefore in violation of the School Health Act. Because livestock markets pose risks of infection from the germs generated when the animals are slaughtered and are considered sanitation hazards, these types of business are strictly prohibited within the Relative Cleanup Zone. Consequently, the Gupo Livestock Market must relocate outside of the Relative Cleanup Zone. However, the Gupo Livestock Market evolved naturally over time, and as a result is not classified as a formal livestock market by the Korea Federation of Livestock Cooperatives. Moreover, dogs are not classified as livestock. Although it is operating as a livestock market, it is unclear as to whether the law can be applied here because it is not a formally classified livestock market. This cruelty is unacceptable. No kind and caring nation will practice such act. Only people who are not civilised will not understand the agony the animals are going through. You really need to stop killing & torturing every animal you see!! There will be a price for what your doing & I really hope when you have to pay you remember all the animals you’ve tortured over the years!! Please understand this is evil simple & plain & I hope you think about changing the way you treat animals!! Goodness! What a cruel and retarded nation! Vile indifference to the horrific suffering! These butchers are disgusting, dead hearted and evil! When will this horror be stopped? Uncivilized, backward country! Really hard to respect and except Asian nations as being civilized when they are torturing, killing and eating our best friends. I WILL BOYCOTT ANYTHING AND EVERYTHING THAT COMES FROM THIS COUNTRY S. KOREA. THIS IS A DISGRACE AND IT SHAMES YOUR COUHNTRY. a COUNTRY WITH SUCH CRUELTY AND LACK OF COMPASSION DESERVES NOTHING!!!!!!!!. THE WORLD IS WATCHING YOU KOREA ……SHAME ON YOU!!!!! These Korean sadistic and callous filth are heartless and soulless. They deserve to suffer in agony the same as their defenseless and innocent victims. 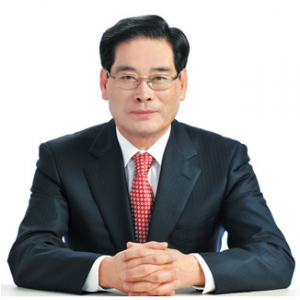 The atrocities these Korean monsters commit against innocent and helpless dogs and cats is evil and pure evil at its worst. It’s DISGUSTING that not one country had stopped this EVIL KILLINGS of DOGS & CATS in stupid, EVIL, PATHETIC & BARBERIC Asia long ago. Asia should NOT BE ALLOWED to have any animals, wild life or Marine life in the whole of SICK, EVIL full of MURDERERS Asia.? May The ALL POWERFULL LORD do to those who do such EVIL back to all the Stupid Asians who kill innocent animals such as dogs, cats, whales, dolphins, monkeys & I can go on go ever. MAY GOD DO WORSE TO ALL WHO DO THIS EVIL.??????????????? ?